I note the new Irish Times website has gone live. Looks like a good, professional job by Web Factory. Well done. The previous address of the Irish Times - Ireland.com - has now changed to a lifestyle/tourism website. Not sure that the execution here is as good. For instance, the new website carries the label 'Beta' in its logo. Can a website really be 'Beta'? An application certainly can - if some functionality still needs to be ironed out. That is where this label is seen most frequently. The classic example is Gmail. After 4 years or more it is STILL in beta. (Nearly finished there lads?) On a website, 'Beta' smacks of the old days of 'under construction', i.e. we are not quite ready to golive, but have to. 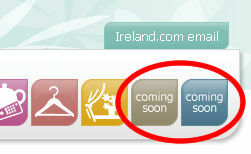 Indeed, the ireland.com website has 2 navigation icons labelled "coming soon". Neither is clickable and so we can't even learn what they have in store. Why not just leave them out? Perhaps it would be better to just say the website is live as-is, hide anything that is not ready and build it up over time. Otherwise, won't it always be 'Beta'?